Library of America, 9781598534535, 1100pp. Acclaimed biographer Hermione Lee presents four “remarkable and surprising” books that collectively capture World War I and the Jazz Age through the eyes of one of our greatest novelists. Edith Wharton achieved the height of her critical and popular success in the 1920s, following The Age of Innocence, winner of the 1921 Pulitzer Prize, with four works that, though less well-known today, reveal the same mastery of dramatic irony and penetrating social satire that place her, with Henry James and Willa Cather, among the foremost writers of her era. The Library of America now brings these brilliant works together for the first time in the fifth volume of its ongoing edition of Wharton’s works. 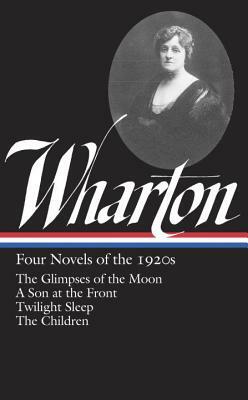 Here are The Glimpses of the Moon (1922), a romance set amid the crosscurrents of upper-class social maneuvering that is considered by some scholars to have been a literary inspiration for The Great Gatsby; A Son at the Front (1923), set in Paris in the First World War, a searing character study of an American painter grappling with his son’s decision to answer the call of duty in the French army; Twilight Sleep (1927), a satire of the Jazz Age and the New York society ladies who turn to drugs, occultism, and other distractions to escape the pain and emptiness of their lives; and The Children (1928), an unlikely love story that editor Hermione Lee has called “a daring and profoundly sad book” and “the most remarkable and surprising of the novels that came after The Age of Innocence.” Also included is a chronology of Wharton’s life, newly expanded from Hermione Lee’s masterful biography of Wharton, as well as helpful explanatory notes. Edith Wharton (1862-1937) is a central figure in American literature, a masterful chronicler of her age and prolific writer in many modes. Her major works include The House of Mirth (1905), Ethan Frome (1911), The Custom of the Country (1913) and The Age of Innocence (1920), for which she received the Pulitzer Prize, the first awarded to a woman. Hermione Lee, editor of this volume, is President of Wolfson College, Oxford, a Fellow of the British Academy and the Royal Society of Literature, and the author of acclaimed biographies of Virginia Woolf, Willa Cather, Penelope Fitzgerald, and Edith Wharton.